Four-time Entertainer of the Year Luke Bryan today announced he is adding a stop on his “Sunset Repeat Tour” to visit New England country music fans with a show at Gillette Stadium on June 21. The concert will include special guests multi-platinum singer/songwriter Cole Swindell, 2018 Academy of Country Music New Male Vocalist of the Year Brett Young and EMI/32 Bridge Entertainment recording artist Jon Langston. DJ Rockwill also appear. 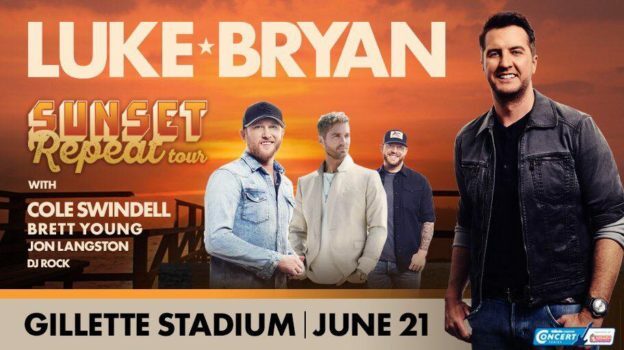 Citi is the official presale credit card of Luke Bryan’s “Sunset Repeat Tour at Gillette Stadium.” As such, Citi cardmembers will have access to purchase presale tickets beginning Monday, March 4 at 10 a.m. until Thursday, March 7 at 10 p.m. through Citi’s Private Pass Program­­­­­­­­. For complete presale details visit www.citiprivatepass.com. Click HERE for Luke’s ‘Sunset Repeat Tour’ playlist. Cole Swindell, a Platinum-selling recording artist and 11-time No 1 singer/songwriter, released his third album, All of It, for Warner Bros. Records/Warner Music Nashville in 2018 and it debuted at No. 1 on the Billboard Country album chart and No. 7 on the Billboard Top 200. The first single “Break Up In The End” became his 8th No. 1 career single as a solo artist. “Break Up In The End” was recently nominated for a Grammy® forBest Country Song and was named one of the best country songs of 2018 by Amazon, Spotify, Billboard, and You Tube among others. Swindell performed the hit single on last summer’s (2018) ABC Television special CMA Fest and when he headlined the NBC’s Citi Concert Series on TODAY(2018). The Georgia native debuted his current single “Love You Too Late” LIVE on ABC’s Dancing With the Stars and in December performed it on Jimmy Kimmel Live! The song is included on YouTube’s Best Country Songs of 2018. ACM New Male Vocalist of the Year Brett Young’s sophomore release TICKET TO L.A. (BMLG Records) debuted atop the Billboard Country Albums chart and features his current fast-rising single “Here Tonight.” The album follows his PLATINUM self-titled debut, which dominated the Top 20 on the Country Albums chart for 37 weeks. Delivering four consecutive No. 1 PLATINUM-certified hits, Young was named ASCAP’s 2018 Country Songwriter-Artist of the Year for his “melodic craftsmanship” (Billboard). He has also garnered nominations from ACM, Billboard, Teen Choice, CMT and CMA Awards as he continues to rack up nonstop hits as “one of country music’s most reliable new hitmakers” (Tennessean). Young has amassed more than 1.4 billion streams of his catalog globally. For additional information, visit BrettYoungMusic.com. Loganville, GA native, singer-songwriter Jon Langston grew up on music like his heroes Alan Jackson and the Eagles. And once multiple concussions ended his Division I football career, he worked to develop his own style and sound while drawing from that variety of influences. In 2013 with the release of his first song, “Forever Girl,” Jon’s live shows began to grow, and he found himself opening for Chase Rice at Georgia’s Kennesaw State University. It was his first-ever full band show, and when the crowd sang “Forever Girl” along with him, Jon knew he wanted to pursue a career in music. Since then, the now 27-year-old Music City resident has not only signed a publishing deal with Sony ATV and is managed by KP Entertainment, but has fostered his own voice in country music and landed a record deal with Universal Music Group Nashville. The Georgia native is the first artist under Luke Bryan’s new label, 32 Bridge Entertainment, and will be worked in conjunction with EMI Records Nashville. He recently released his major label debut single “When It Comes To Loving You” which landed in the Top 5 of the all-genre iTunes Chart and has accumulated over 9 million streams. For the past 15 years, DJ Rock has performed for crowds in premiere venues throughout North America and Mexico. As an open format DJ he is well versed in all music formats, spinning everything from country to hip hop to rock to today’s top 40 hits. He’s worked alongside artists like Luke Bryan, Snoop Dogg, Florida Georgia Line, Gucci Man, John Legend, Jennifer Lopez, Blake Shelton and more. Rock has also appeared at some of the biggest-selling music festivals including Off The Rails, Rock The South, Route 91 and Tortuga. 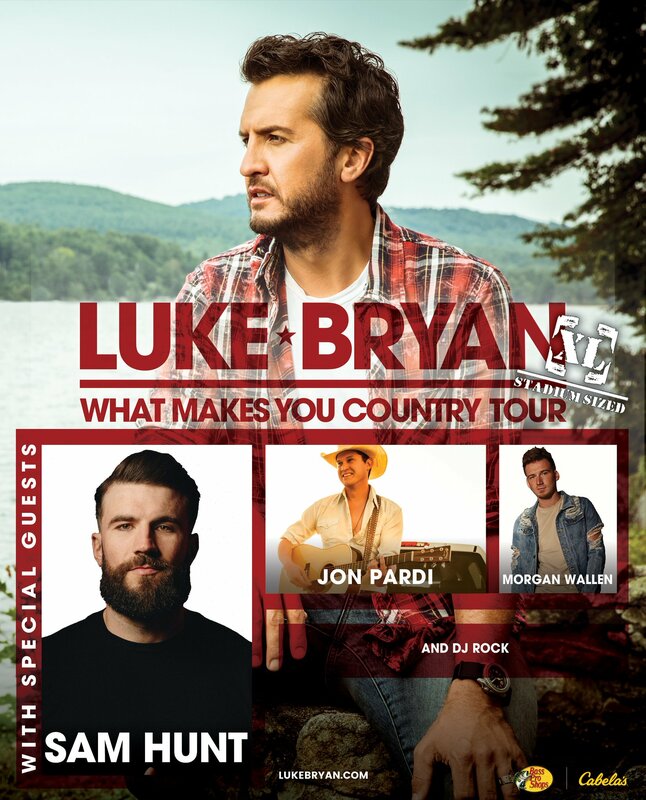 Rock last appeared on Luke Bryan’s “What Makes You Country Tour” in 2018. Gillette Stadium, located in Foxborough, Mass., is New England’s premier sports and entertainment venue. The 65,878-seat stadium is the full-time home of the NFL’s six-time Super Bowl Champion New England Patriots, which has sold out every home game at Gillette Stadium since the venue opened in 2002. Gillette Stadium is also the home field of the New England Revolution of Major League Soccer and one of the world’s top grossing concert venues, according to Billboard and Pollstar. Other notable sporting events held at Gillette Stadium include the 2016 NHL Winter Classic, international soccer matches, NCAA athletics, professional lacrosse, motor sports and the Massachusetts high school football state championships. For more information, visit www.GilletteStadium.com or follow @GilletteStadium on Twitter, Instagram and Facebook. This entry was posted in Home page blog and tagged Brett Young, Cole Swindell, Gillette Stadium, Jon Langston, Luke Bryan, NECM, New England Country Music, Sunset Repeat Tour on March 1, 2019 by New England Country. 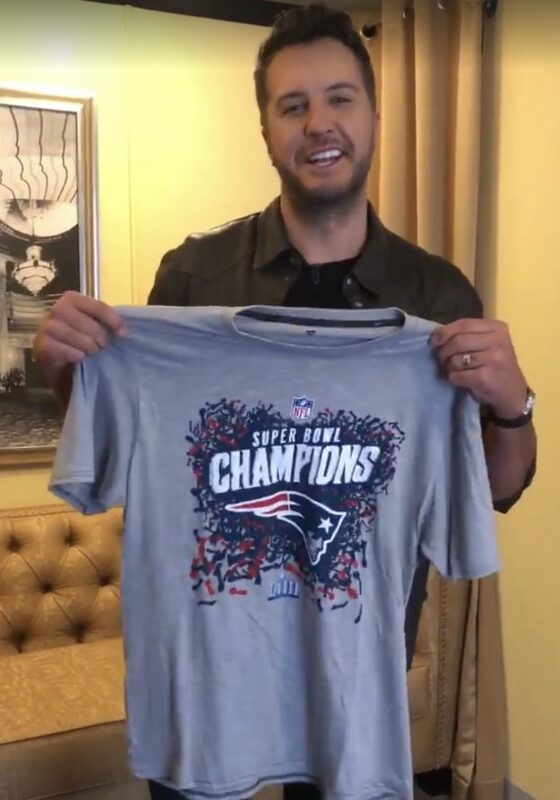 Luke Bryan Gets Patriots Super Bowl Shirt But Why? Summer concert season is coming! We know that with all of the great show announcements we’ve gotten recently. Between the shows in Mansfield, Boston, Gilford and the others across the region, summer 2019 is going to be full of great shows. 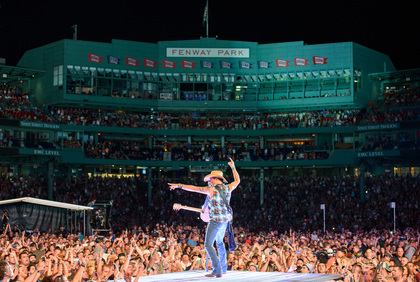 But with Kenny Chesney already announcing he would not be playing stadiums in 2019, we’ve been waiting for THE show of the summer. And we might’ve gotten it… Let’s get into it. Earlier tonight, country megastar Luke Bryan posted a video on his Facebook saying, “So this shirt came in the mail today. And it kinda got me thinking…” And with a smirk, he turned the shirt around to show it as a Patriots Super Bowl Champs shirt. 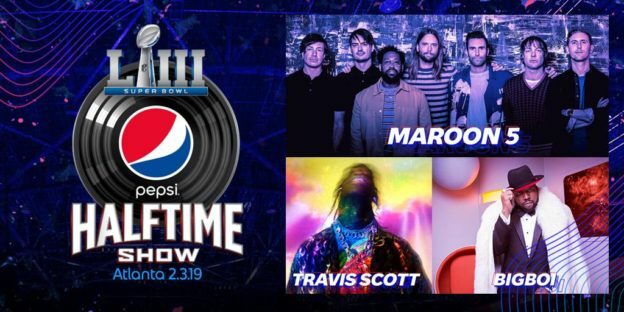 While some may have thought he was talking about potentially playing the Super Bowl halftime show next year, all signs point to him returning to Gillette Stadium in 2019. Let’s face it, Luke is a Falcons fan, as he grew up in Georgia. He’s probably still a bit bothered by Super Bowl LI… we don’t blame him. He’s not going to get a Patriots Super Bowl shirt for the hell of it. UPDATE: Gillette Stadium just posted the below video! This MUST mean Luke is coming back to Gillette this summer! We can’t wait! We’ve been waiting for an epic country show we can tailgate for this summer! This WILL be THE show of the summer! When more info becomes available, we will share it! Stay tuned. 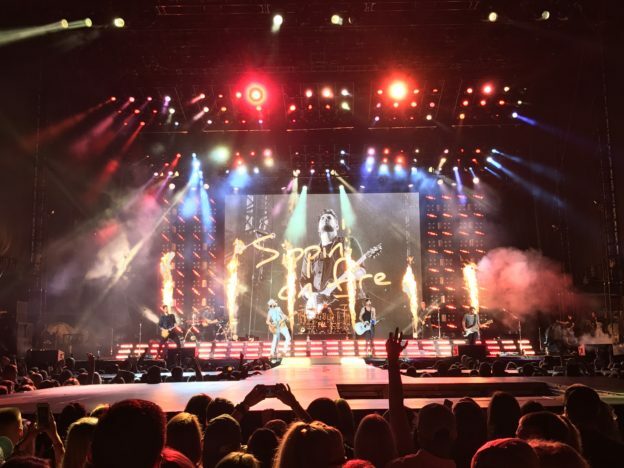 This entry was posted in Home page blog and tagged Gillette Stadium, Luke Bryan, NECM on February 14, 2019 by New England Country.